Accepted Scientific Name: Mammillaria haageana Pfeiff. Allg. Gartenzeitung (Otto & Dietrich) 4: 257. 1836 Otto & A.Dietr. 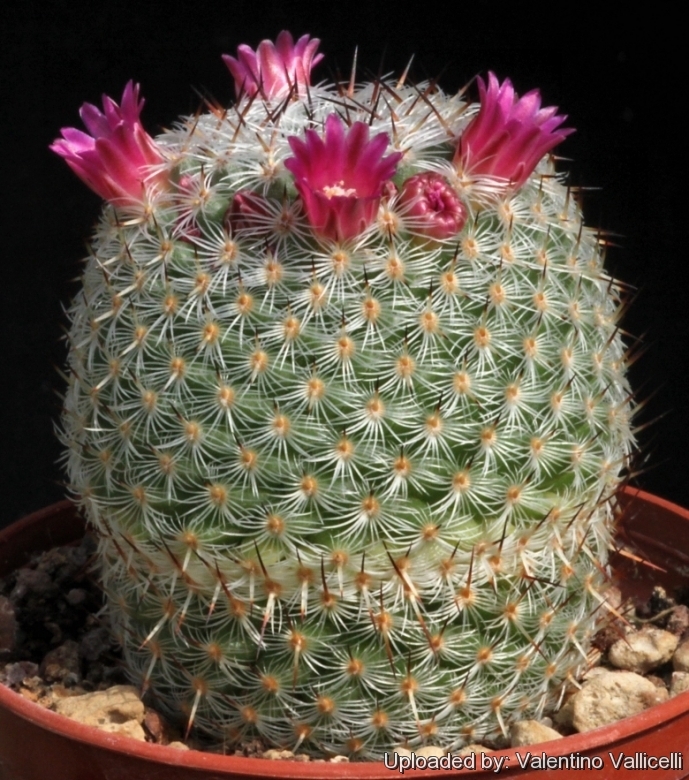 Origin and Habitat: Mammillaria haageana is widespread and endemic to Mexico, occurring in the States of Puebla, Mexico, Veracruz, Morelos, Tlaxcala, and Oaxaca. Altitude: 450-2600 metres above sea level. Habitat and Ecology: The elevation range where this species occurs is wide, therefore it is found in many different vegetation types such as deciduous tropical forest, xerophyllous scrub, oak forest and secondary vegetation, juniper forest, pine forest, lava flows, and often in disturbed areas. It occurs in Cardonal-tetechera. The plants are commonly associated with nurse plants, but can also occur in bare areas. This species is locally threatened by the overcollection of wild populations for use as an ornamental. Mammillaria donatii Berge ex K.Schum. Mammillaria acultzingensis Lizen et al. 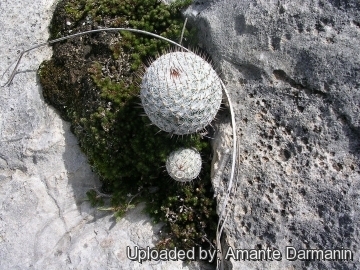 Mammillaria haageana var. collina (J.A.Purpus) Lizen et al. 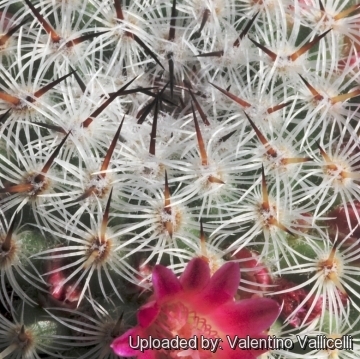 Mammillaria conspicua var. vaupelii (Tiegel) Repp. Description: Plants usually solitary, sometimes sprouting at the base or sides when old. Each head is surrounded by a complete ring of starlike pink flowers. There are ample variations among plants from different origin. Stem: Globularor somewhat elongate in age, glaucous green, up to 15 cm high, (3-)5-10 cm in diameter, apex wolly. Tubercles: Small, (3-)5-6 mm hight, crowded, conical/pyramidal, four-angled basally. Axil: Slightly woolly only on new growth, later naked. Areoles: 2-3 mm, oval, whith white wool when young. Radial spine: (14-)8-30(-38), smooth, acicular, straight or slightly curved, white, radiating, bristly, 3-6 mm long. Flower: Deep magenta-pink to pale pink, funnel-shaped, up to 10 mm long, 8-15(-20) mm in diameter. Pericarpel 1,3-2,5 mm long, receptacle-tube 1,3-2,9 mm long, external tepals 2-10 mm long, 1-2 mm wide, linear-lanceolate purple red with a greenish base, internal tepals 6-11 mm long pink to purple with a darker midvein. Filaments whitish or pinkish. Blooming season: February to April. Fruit: Red, pinkish at the base, about 1 cm long. pale pink flowers to 15 mm in diameter; Distribution: Puebla, Mexico, Veracruz, Morelos, and Oaxaca. Mammillaria haageana subs. conspicua (J.A.Purpus) D.R.Hunt: It is often solitary and has stems 10-11 cm in diameter; Distribution: Puebla, Oaxaca, and Morelos. Mammillaria haageana subs. elegans D.R.Hunt: It is solitary, has stems 5-8 cm in diameter, and rose red flowers; Distribution: it is found in open, grassy areas in Puebla. Mammillaria haageana subs. san-angelensis (Sánchez-Mej.) D.R.Hunt: It is usually solitary, has stems 4-7 cm in diameter, and pink to carmine red flowers; Distribution: It is found in the valley of Mexico. 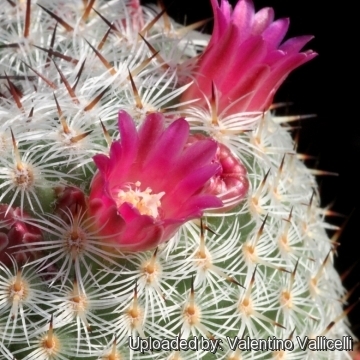 Mammillaria haageana subs. schmollii (R.T.Craig) D.R.Hunt: It has narrower stems and reddish brown to black spines; Distribution: Mitla, Oaxaca. 8) Hernández, H.M., Cházaro, M. & Gómez-Hinostrosa, C. 2013. Mammillaria haageana. In: IUCN 2013. "IUCN Red List of Threatened Species." Version 2013.2. <www.iucnredlist.org>. Downloaded on 12 January 2014.